Howdy Davis stands with Kyle Bell at the Mountain Man series. Howdy Davis and his brigade of Mountain Men, Tanner Snyder, Wyatt Bellio and Carlin King, met the stars of the famed TV Series the Mountain Man. All members spent 12 days camping in the Uncompahgre Mountains in the San Juan Mountain range with Tom Ore, Will Stringfellow, Kyle Bell and his son Ben. 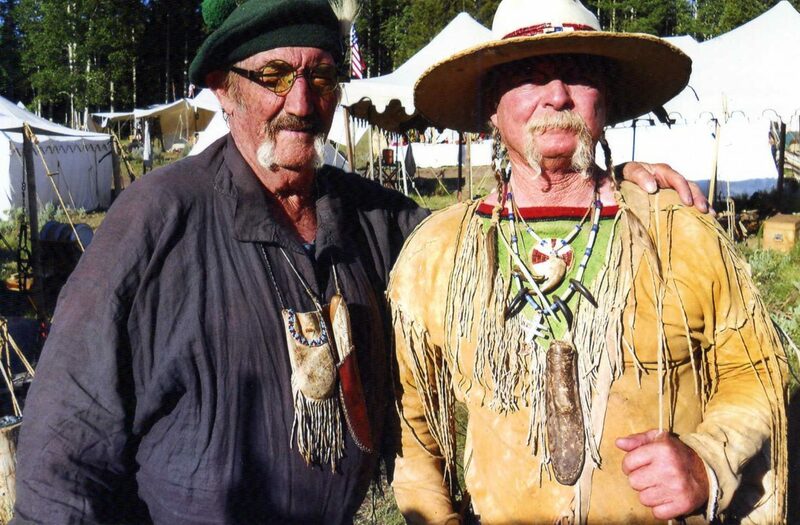 “We spent all of our days honing our skills in the fashion of the pre-1840 Mountain Men,” Davis said. All claimed awards in the knife and hawk throwing, primitive archery and black powder shooting. The group was camped 25 miles back in the mountains at 9,800 feet and saw lightning almost daily. There were more than 300 camps and 21 sulters where they were able to resupply for the coming year. Seminars were well attended on blacksmithing, Celtic history, fur trade, making gourd water bottles and with many other skills. “Our evenings were filled with all sorts of musical sing alongs and story telling. We will rendezvous again in 2015 in the mountains of western Wyoming,” Howdy said.